Kathmandu, Pokhara and Nagarkot tour with Kathmandu city, Pokhara and Nagarkot is a places enjoying beauty of nature, culture and historical. Tour of Natural, cultural and historical heritages of two major Nepalese tourist cities. This cultural tour will help you get acquainted with diverse facets of Nepal and Nepalese culture. This carefully designed trip takes you to the major sightseeing destinations in Kathmandu, such as Durbar Square of Hanuman Dhoka, Buddhist Stupa of Swoyambhunath and Boudhanath and Hindu temples of Pashupatinath. After Kathmandu, you will get to visit the famous cultural and religious sites of Patan like Patan Durbar Square, Mahaboudha Temple, Kumbeshwor Temple, Krishna Temple, Golden Temple, etc. After sightseeing of Kathmandu and Patan and visit old Durbar Square Bhaktapur and your next destination is Pokhara. 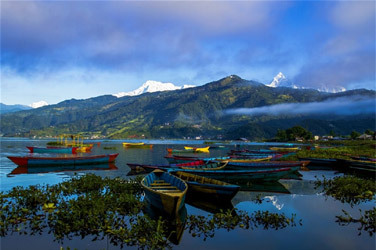 Pokhara is a beautiful city and one of the most famous tourist destinations. Lying 200 km away from Kathmandu, Pokhara is overlooked by the beautiful Annapurna Ranges and spectacular snow-capped mountains. During the course of this trip, you will be guided to the most popular places in Pokhara like Phewa Lake, Begnas Lake, Rupa Lake, Mahendra Gupha, the Davis Fall, the gorge of the Seti River, etc. Your stay in Pokhara with Legendry Machapuchhre's spectacular view as a backdrop amidst the enchanting ambience of nature, bestows you with an experience of a lifetime.